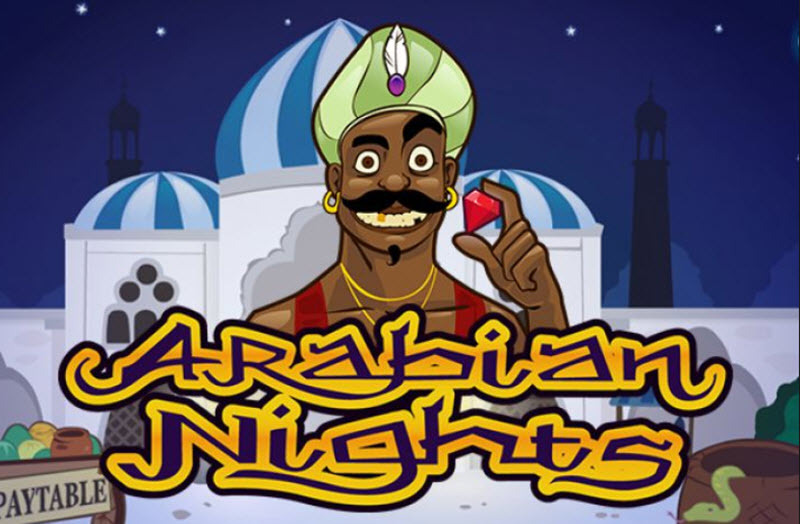 Arabian Nights is a NetEnt slot famous for its big progressive jackpot. It was launched back in 2005 (and it shows) but is still very popular among players in NetEnt casinos. It’s a good choice if you want to hope for a huge progressive jackpot, or if you enjoy back-to-basic slot games without bonus rounds, interactivity and complicated special features. 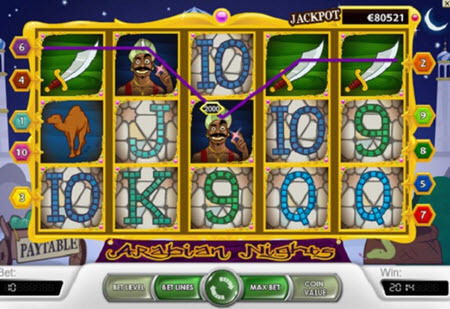 Arabian Nights only have a standard wild symbol + a scatter symbol that can hand out 15 free spins (without special features). There are only 10 paylines and you can’t adjust the coin value. In some online casinos, this progressive jackpot is unique to the casino and only fed (and won) by players in that particular casino. Other online casinos have opted to participate in a pooled Arabian Nigths progressive jackpot managed by NetEnt and feed jointly by players in all participating casinos. The fact that a casino is hosting a unique (not pooled) progressive Arbian Nights jackpot doesn’t autoamtically mean that the jackpot is smaller than the pooled one. Paf Casino did for instance pay out a non-pooled Arabian Nights progressive jackpot containing €8,635,872 back in 2012. What it does mean is that a savy player with multiple casino accounts can move around from one casino to the next and always make sure to play Arabian Nights in one of the casinos that is currently offering the largest jackpot. The theme for Arabian Nights is the mysterious orient as we know it from old-fashioned tales and legends. The sound will help you get into the right mode. Examples of symbols that can appear on the reels are Arabian slippers, a beduin tent, a man wearing a turban, an oil lamp, a red fez, a dromedar, and a saber. Unlike most slots from NetEnt, you can’t adjust the coin value on Arabian Nights. If you play in Euro, the coin value is always €0.50. Also, you can’t adjust how many coins to bet on an active payline – it’s always 1 coin per active payline. What you can adjust is how many of the paylines to activate (i.e. bet on), from just 1 payline to all 10 paylines. This means that the smallest possible wager is €0.50 coin value x 1 coin x 1 payline = €0.50. The largest possible wager is €0.50 coin value x 1 coin x 10 paylines = €5. Important: You can only win the progressive jackpot on a max bet. The man wearing a turban is a wild symbol, and he can substitute for any of the regular symbols to form a winning combination. He can not substitute for the scatter symbol (the oil lamp). When a winning combo is formed with the help of a wild, the coin win is doubled. The wild symbol is also the key to winning the progressive jackpot on Arabian Nights. If you get five wilds lining up on a payline, after having made a max bet, you win the progressive jackpot. The oil lamp is a scatter symbol. If you get at least three scatters simultaneously, anywhere on the reels, you get 15 free spins.